Pom poms are fun and fuzzy little things which take just minutes to make. But did you know that these versatile puffs of yarn can also be used in so many craft projects? You don’t have to use a pompom maker, you can make pompoms the old fashioned way using a cardboard donut, a strip of card or even using a fork. Making pompoms is a great fine motor activity and perfect for quiet time. 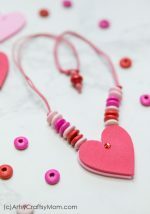 So gather your colorful yarn and a pair of scissors to explore these 20 Pretty Pom Pom crafts for kids to make and of course, play with afterward!! Shaun the Sheep would be jealous how how adorable this little pom pom sheep is (and how easy he is to make). Project courtesy: Mum in the Madhouse. Celebrate any fun party with these adorable mini pom pom ice cream cones from Hello, Wonderful. They’re bright, colorful and look like just the real thing without the added sugar (yay!). Do you have a starry-eyed child with a serious obsession for space? Feed their enthusiasm with the power of planetary pom poms in this this step-by-step project from We are Scout. Take pretend play a notch higher with this cute yarn play town set! Learn how to make each element in this cute town with some neat tutorials from Mr. Printables. Here’s an adorable keychain from Craftables that your kiddo can make for all the rooms in the house! You can even color coordinate them, so that they can be identified easily from a pile of keys. While it is probably too late in the season for pumpkins, they still make cute little accessories for bookshelves and other nooks and crannies. Get your own colorful pompom pumpkin patch with this cute project from It all started with paint. This pom pom rug from Hello Wonderful is such an easy craft for your older kids to make! Just imagine resting your tired feet on that sea of fluff! 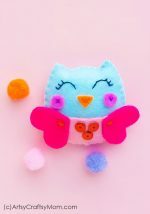 This Pompom chick project from Crafty Morning is adorable and simple to boot! This Pom Pom craft is perfect for Easter too! Pompom pencil toppers are super cute and also a great way to get the kids to stop chewing the pencil ends. Hop onto Blue Susan makes for the tutorial. 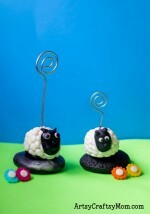 These pompom fridge magnets from Alyssa & Carla are a quick and fun project. They are inexpensive, easy to make, and add just the right amount of pop to a refrigerator. With a little yarn and some sticks you can make an instant spring bouquet without hitting your local florist. Keep reading from Taboula.de to see how! These stripey pet bees made with pompoms are so much fun! Get all the instructions over at Molly moo crafts. 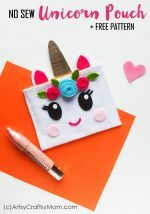 This Valentine’s Day, surprise your special someone with a cute little Love Monster with this project from Consumer Crafts. Make your festive party hats stand out by adding a fluffy pompom in bold colors. These hats by Tell Love and Party are super simple to make and will add a special touch to any celebration. Whether you’re happy, sad, or LOL with tears, there’s an emoji that describes your feelings. These surprisingly quick-to-make—emoji ornaments from Momtastic are totally fun and a cinch to make! Get a bit of spring indoors with these colourful pompom caterpillars. All you need are pegs and pom poms – along with the instructions from Scattered Thoughts of a Crafty Mom. 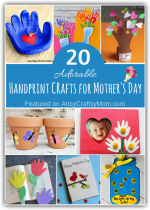 Here’s a fun craft from A Crafty Morning for kids to do for Spring or even for a Mother’s Day card! You can make beautiful flowers using paint, pom poms, and clothespins! Ideal for Kids who don’t like to get their hands messy. Everything is better with pompoms! And this pompom mobile from A burst of beautiful is certainly no exception. It’s adorned with colorful, fluffy pompoms on a simple wooden frame. Well who doesn’t love pom poms and even more so, mini pom poms? These pom pom crafts for kids are super easy to make and just too cute! 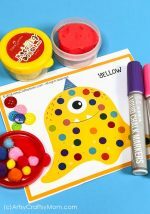 They can be used to decorate a multitude of things, and with so many different colours, think of all the different possibilities to craft using them! What’s your favorite pom pom craft? We’d love to hear about it in the comments below! I would like to unsubscribe to your notifications. How do I do that? Can you do that for me? Thanks. I should not have clicked on allow notifications.